Built in 1868, this mill was purchased in 1882 by August Beckmann and was operational until 1954. In 1990 area volunteers began its restoration. 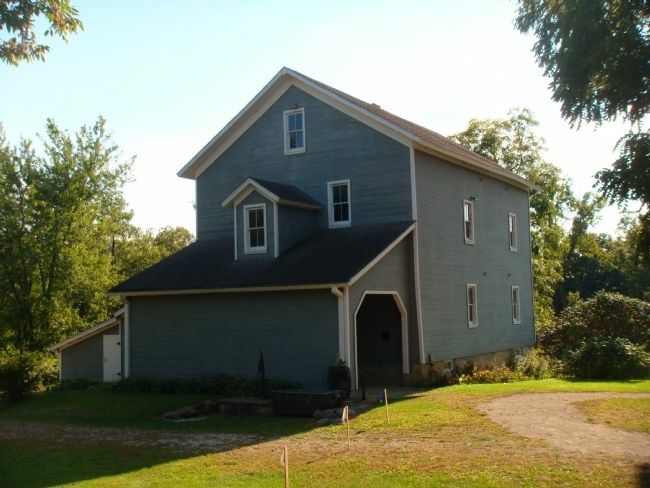 The mill operates on its original equipment by water power and is listed on the National Register of Historic Places. Location. 42° 30.627′ N, 89° 10.199′ W. Marker is near Beloit, Wisconsin, in Rock County. Marker is on County Highway H 0.1 miles east of West Smith Road, on the left when traveling east. Touch for map. Marker is at or near this postal address: 11450 South County Highway H, Beloit WI 53511, United States of America. Touch for directions. Other nearby markers. At least 8 other markers are within 10 miles of this marker, measured as the crow flies. How-Beckman Mill (within shouting distance of this marker); Abraham Lincoln (approx. 6.9 miles away); Black Hawk at Turtle Village / The U.S. Military at Turtle Village (approx. 6.9 miles away); Roy Chapman Andrews (approx. 6.9 miles away); Beloit College (approx. 7.1 miles away); Rasey House (approx. 7.1 miles away); Wisconsin's First Aviator (approx. 9.2 miles away); The Medal of Honor (approx. 9½ miles away). Touch for a list and map of all markers in Beloit. 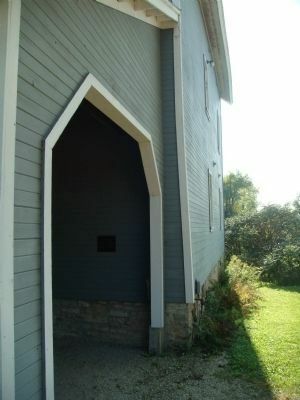 The marker is just inside the covered area of the mill building. More. 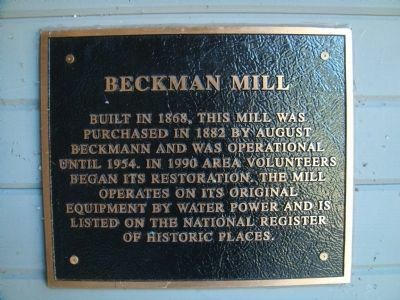 Search the internet for Beckman Mill. Credits. This page was last revised on June 16, 2016. This page originally submitted on November 13, 2011, by William J. Toman of Green Lake, Wisconsin. This page has been viewed 306 times since then and 9 times this year. Photos: 1, 2, 3. submitted on November 13, 2011, by William J. Toman of Green Lake, Wisconsin.